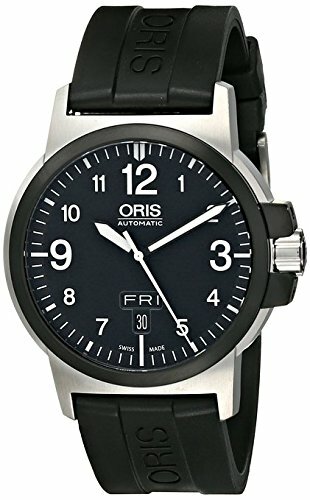 Oris Men’s Watch 73576414364RS Review. Anyway, I’ll get on with my 73576414364RS review below and you can find out the price on Amazon today, enjoy. This timepiece from Oris has a lot of brilliant features I love to see in a watch, and I’ll be taking a look at each of them in time. 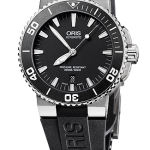 Oris have been making excellent quality luxury timepieces for quite some time now, and with that comes the extra expected cost. The watch is Swiss made, features an impressive automatic movement, and has an excellent scratch resistant glass that I’ll explain more about shortly. One of my favourite features of this watch is the exhibition caseback that allows you to take a look at the inner workings of the watch (There’s a picture of this further below). As I’m sure some of you could have guessed, the hands and numbers are coated in a long-lasting lume that makes the watch even easier to read in dim lit conditions. 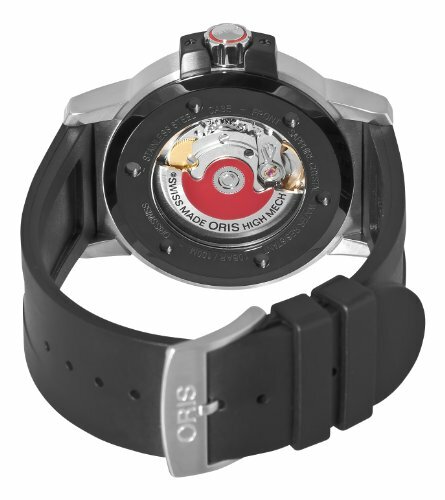 At the heart of this Oris watch is an Oris caliber 735 automatic movement. It has a 26 jewel finish and runs at 28,800 vibrations per hour. It also has a pretty impressive power reserve as you’d expect from this level of watch, 38 hours. Automatic watches are great, no need for a battery and they power themselves from the wearer’s movement. The only trouble with automatic watches is that once you stop wearing them for some time they will need to be reset. 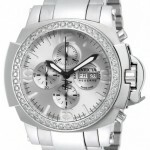 As I had expected to see this watch has an excellent sapphire crystal glass protection the front and rear of the watch. Sapphire glass has a Mohs hardness rating of 9 and are extremely scratch resistant. As we’ve also come to expect from luxury watches, this model’s glass is coated in an anti-reflective anti-glare treatment. With a case diameter of 42mm this is classed as a large men’s watch. 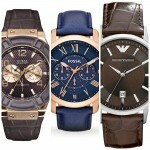 This is a very popular size for men’s watches these days as people are going for larger and larger designs. The thickness of the casing is 11mm which means it avoids being overly chunky and sits nicely on the wrist. I rather like the interesting date display on this watch, it’s not too often you see them display one over the other like this. It isn’t perpetual though so you’ll have to adjust it for the varying amount of days in each month. This Oris watch has a nice, comfy black rubber strap with a stand buckle to fasten it with. The strap is 22mm wide that makes it just slightly larger than standard but it still fits in nicely with the whole theme of the watch. I’ve quite enjoyed taking you on a walk through of this watch from Oris. It has everything I’d expect to see in a Swiss-made luxury watch from this brand. I love the impressive automatic movement and the way you can take a look at it through that exhibition caseback. Overall I’d say it’s a very good watch that is well worth checking out.